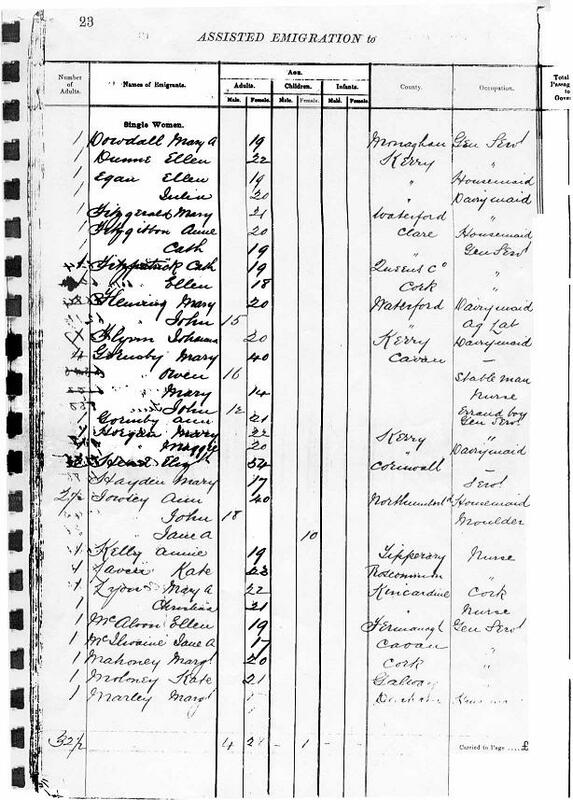 Passenger List pdf 259k count 336 souls, created 31st Oct. 1877. In the first column of the passenger lists there are notations, i.e. with the single men John Bodley, Michael Cummings, Henry Clulow, Michael Duncan, Timothy Sealy, Timothy Sullivan, went to Timaru, Michael Carroll to Ashburton. Daniel Brown to East Oxford. Stephen Buckley and Jeremiah Touhy, who were travelling together from Cork, went to Timaru. Maurice Fitzgerald was travelling with the O'Donoghue's from Co. Kerry went to Timaru. John Healy went to Christchurch. Honor Grelish had a sister at Mr Ropess, Armagh St. CHCH. In the single women section Jane Hunt and Matilda Lloyd, Mary J. Thomboe, Fanny Gill, Ellen Milligan, went to Timaru. Margaret J. Balfour, age 33, was the Matron. Laura and Mary S. Walkins went to Ashburton. Eliza Lee went to Oamaru. Jane Campbell, Eliza, Emma and Kate Turnpenny went to Westland and Catherine Vondy went to Nelson. The Hereford an iron ship with two decks and one cemented bulkhead was built in 1869 by J. Elder & Co. at Glasgow for the Merchant Shipping Co., of London. Owner: J. Nourse. She was chartered by the New Zealand Shipping Company in the seventies and made three voyages out to New Zealand all to Lyttelton with approximately three hundred emigrants each time. The first voyage out was under the command of Captain Elsden, R.N.R. in 1874 and took 87 days port to port. Her second voyage commanded by Capt. McCarthy, she sailed Oct. 19 Gravesend and passed Deal. 20 Oct. arrived Plymouth, sailed 31 Oct. 1877 from Plymouth with 336 emigrants equal to 300 statute adults. Nov. 28 - Equator 28W. Dec 18 - Cape of Good Hope Easting 43/48. Passed the Snares Jan. 17 and arrived Lyttelton 19 January 1878, 80 days port to port. Voyage account recorded below. Made some runs of 310, 305 and 302 days in the Southern Ocean. Sailed hence Newcastle then Frisco. Lyttelton 21 Feb. 78. April 12 - cleared Lyttelton for London. April 14 - sailed Lyttelton for London. July 2 - arrived Gravesend. I have the honor to advise the sailing of the Ship 'Hereford' from Plymouth for Canterbury on the 31st day of October with 336 emigrants equal to 300 Statute Adults and herewith enclose the original promissory Notes. The Ships book, Certified List, and original testimonials of the emigrants have been forwarded to the Immigration Officer at Christchurch. The gratuities payable on the recommendation. The Honable, The Minister, for Immigration Wellington. Arrived - January 19, Hereford ship, 1410 tons, M'Carthy, from London. New Zealand Shipping Company agents. . Passengers: saloon - Rev. Peter Hope, Mrs Hope, Mr and Mrs Akerman, Mr Chas. Stevens and servant, Dr. and Mrs Akerman, Messr A. Shekleton and A. Lehyen and 300 Government immigrants. The ship Hereford arrived from London on Saturday, after a splendid passage of eighty days from Plymouth, at which port she embarked her immigrants. She was signalled the first thing on Saturday morning and just before noon the Health Officer went down to her in the Customs launch. The Hereford is now commandeered by Captain M'Carthy who was her chief officer on the occasion of her last voyage to this port in 1874. From what could be seen she arrived in very good order and in answer to inquiries made as to how her numerous passengers fared on the passage, it was gathered that all must have been very comfortable. The health of the immigrants, the medical superintendent, Dr. W.H. Maberly, reports as having been very good all through the passage; no sickness of any kin was experienced worthy of note. The doctor speaks of the immigrants as being a well-behaved and good class of people, and they in their turn, so far as could be ascertained appear to have been pleased with the treatment received in the hands by them. The following is the reports of the passage furnished by Captain McCarthy;- Left Plymouth on October 31 and took final departure from Lizard at 2 a.m. on November 1. Experienced strong variable westerly weather across the Bay with high sea, and fell in the north-east trades on November 1. Experienced strong variable westerly weather across the Bay with high sea, and fell in with the north-east trades on November 14 in 25 north. They were shy and only lasted until November 16. The south-east trades which were picked up on November 26; proved moderate and the equator was crossed the same day. Fresh variable winds prevailed from that time to passing the meridian of the Cape on December 18. Ran down the easting between 43 and 48 south. The westerlies being good, some capital runs were made, the ship doing 310 miles one day. Made the snares on January17. Had fine weather and south-west and westerly winds up the coast, and was off Akaroa on Friday evening and made the heads that night coming up the harbour on Saturday morning and anchoring off Rhodes's Bay at 10 a.m. The land sighted on the passage was Martin Vaas and Trinidada on December 4. Tristan d' Acunba on December 11, The ship Peterborough for Sydney left in company with the Hereford and on November 6 the ship Renown from London to Melbourne, was spoken to twenty-five days out. Assisted Emigration to Canterbury, New Zealand, by the Ship Hereford 31 Oct 1877 page 16 (total 35 pages). Arrived Lyttelton 9 January 1878. The passenger lists name of emigrant, age, county, occupation, total cost of passage money to the government. Total cost of passage money to the Government for each of these single men paid �13 11s 6p. Ultimate cost to the Government �73 71s 6p. Hockings	Thomas	 19 Devon	 Farm Lab Went to Longbeach and worked for Griggs. He d. 1908 buried at Waterton. Total cost of passenger money to government, �49 16s. Tonnage: 1,524 tons gross, 1,351 under deck and 1,469 net.